"Extremely high accident/injury claim losses" means higher premium costs get passed down to the skaters. One day after updating its rulebook for 2015, the WFTDA has updated something else it provides to many skaters in the United States. Unlike the rules, however, this is an update that people were not anticipating and probably won’t be as eager to see implemented on January 1. 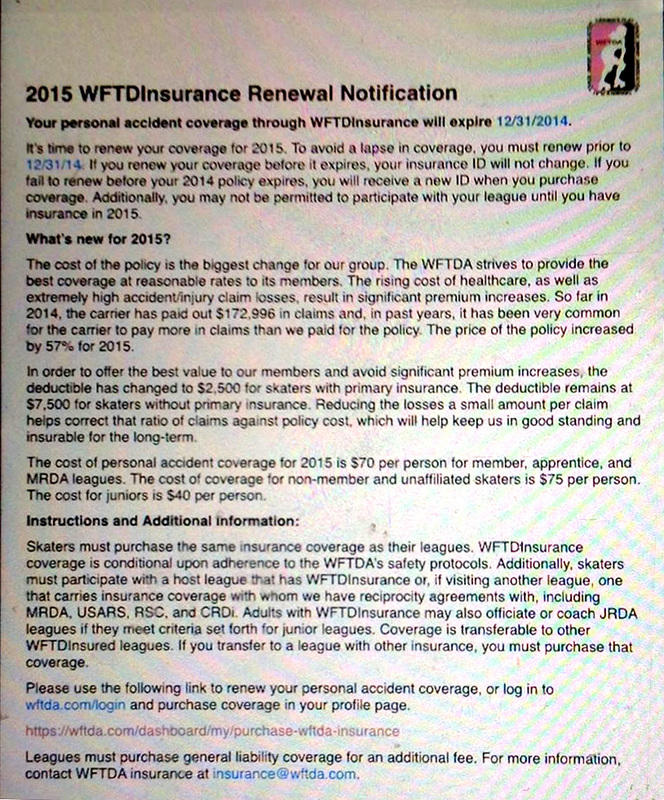 The notification, as emailed to member and non-member skaters covered by the WFTDA. 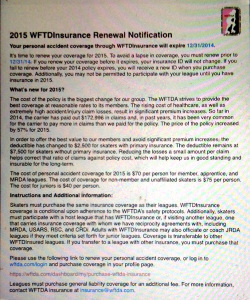 In an insurance renewal notification email sent out earlier this morning, pictured right, the WFTDA alerted member and non-member skaters covered by its plan that due to “extremely high accident/injury claim losses” on the part of its insurance carrier, the group policy that the WFTDA uses to cover enrolled skaters has increased in cost by 57% for 2015.1 This significant price hike on the WFTDA’s end means that nearly everyone purchasing its personal accident coverage will have to pay more next year, too. The individual cost for players affiliated with WFTDA member, WFTDA apprentice, and MRDA member leagues is now $70; non-affiliated skaters must pay $75. This is a $10 increase for both classes of insurance. The annual cost of general liability insurance for member and non-member leagues has also risen to $300 and $350, respectively, up $50 each from their 2014 levels. The $40 rate for individual junior skater coverage and $250 rate for junior league general liability insurance remains unchanged for 2015, though the higher deductible still applies. The league-level $2 million general liability and $5 million excess liability benefits will also remain the same. Paying $10 more for insurance you have to have probably won’t be an issue for most, but needing to pay $1,000 more for insurance if the time comes when you absolutely need it? That may be a different story, one that a few out there may not be okay with. Spending more money than one takes in is, unfortunately, a too-common occurance in the roller derby world. Provided these price and rate adjustments serve their intended purpose, however, this particular problem may only be a one-time deal. Besides, it’s not all bad news for the WFTDA. Compared to USARS, which also offers individual accident protection and league liability policies, many find the pink and black a better deal and less of a hassle to deal with than the red, white, and blue, even if USARS insurance has been getting better lately. Still, in light of the WFTDA price hikes, individual skaters and unaffiliated leagues will probably want to shop around and see what kind of coverage works best for their situation. The major roller derby insurance plans reciprocate with each other, so you’re probably safe no matter what option you go for. Just be sure check in advance with your league, or any other that you skate with.